To make your own mobile planter with industrial flair, you don't need any obscure tools or extraordinary skills—only some time and a bit of determination. 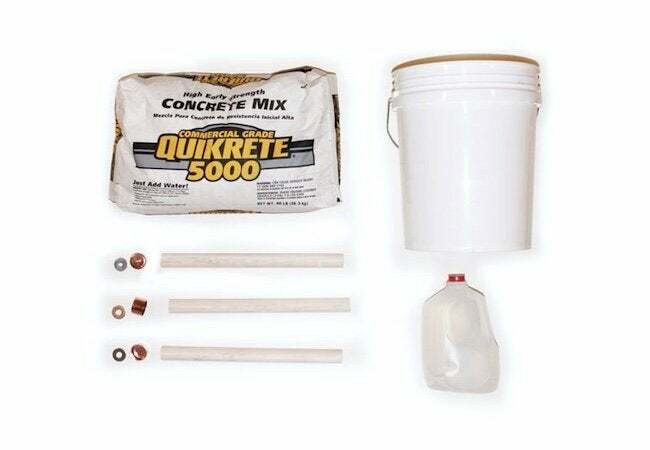 concrete, some basic tools and materials, and the willingness to get your hands a little dirty. 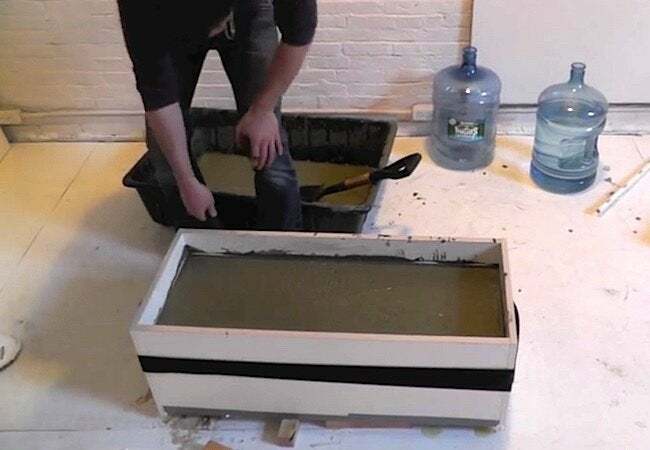 Case in point: By following the simple steps detailed below, you can make a concrete planter like the one pictured above. 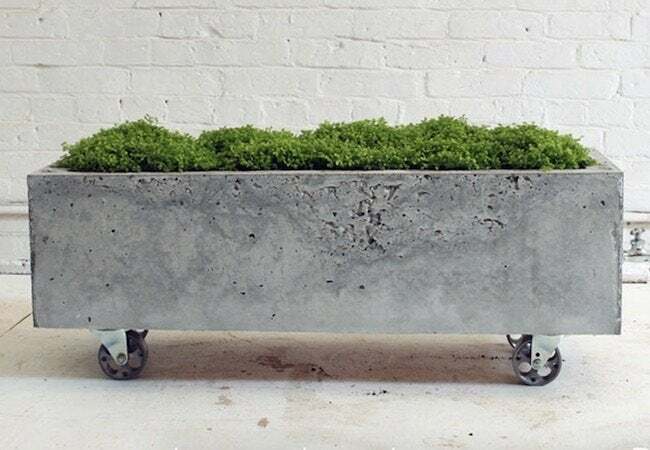 Equally suited to interior and outdoor spaces, the long-and-low planter features a no-frills industrial aesthetic that celebrates the material it’s made of. Though a similar piece might sell for hundreds at a trendy retail store, DIYing your own version costs next to nothing. Scroll down now to see how easy it can be to build something truly lasting. For wet concrete to take on the right shape, the material must be placed into, and allowed to dry within, a form whose hollow spaces correspond to the desired design. You can build your own form out of scrap melamine or laminate, but it’s faster and easier to repurpose something you’ve already got on hand; here, an old kitchen cabinet did the trick. Of course, if you were to fill the entire cabinet interior with concrete, the material would cure into a massive block. So, in order to make way for the sides and the trough-like middle of the planter, you’re going to set rigid foam insulation into the cabinet. 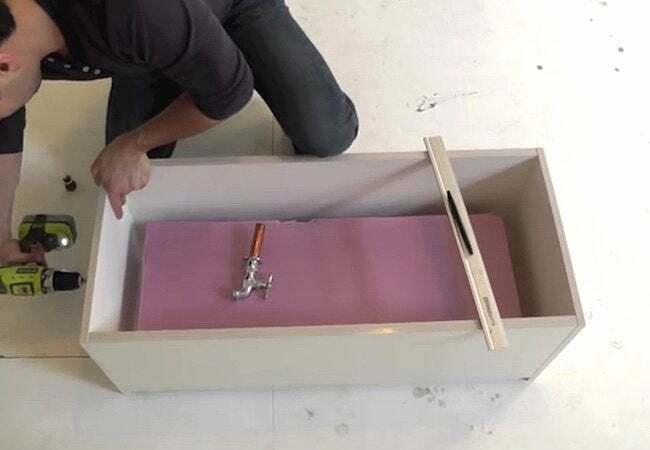 With a utility knife or even a circular saw, cut three equal pieces of two-inch-thick insulation in such a way that, when placed into the cabinet, they leave two inches of free space on all sides. 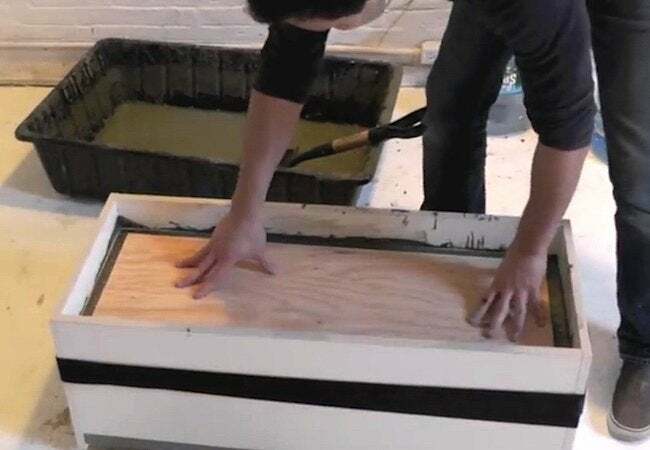 Now, using construction adhesive, secure the initial layer of foam to the inside back wall of the cabinet (which will be the top of the planter), then proceed to adhere the additional two pieces to the first and to each other. To simplify the project a bit, you can skip this step. If you want the planter to serve its purpose well, however, you should add drainage—which, in this project, is provided by a spigot. Although the spigot itself is added in a later step, its accompanying half-inch brass pipe must be introduced now. Choose one of the shorter cabinet sides and measure down from the top cabinet edge to the top edge of the foam. Then mark that same distance on the outside of the cabinet and drill a half-inch hole there. Finally, fit the brass pipe through the hole you’ve drilled, cutting back the insulation to make room. Finally, duct-tape the pipe to the foam. Before bringing concrete into the equation, it’s important to seal any holes or cracks that you notice in the form. If your form has no imperfections, it’s at least necessary to use silicone caulk to seal the hole you drilled to accommodate the brass pipe. Also, bear in mind that once you begin shoveling concrete into the form, its sides are going to be stressed by the material’s heavy weight. For that reason, it’s wise to brace the form with L-brackets, a ratchet strap, or simply a few lengths of rope. Last, mark a line about two inches below the top edge of your form. 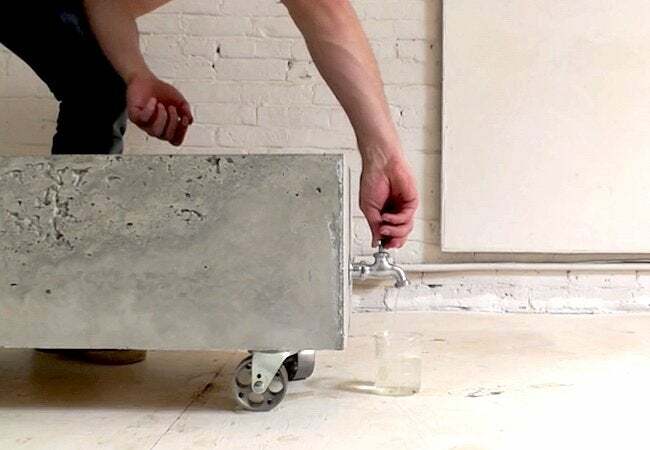 You’ll be filling the form with concrete up to, but not beyond, that line.
. As you’re preparing the material, resist the temptation to put more water in the mix in hopes of making it more pliable. Too much water results in weak, crack-prone concrete. Hew closely to the instructions printed on the package, mixing until the concrete has the consistency of cookie dough. Once ready, transfer concrete to the form, little by little. Be sure to pack it down into all the corners and crevices, using a stick or piece of scrap wood, if necessary. Pay special attention to the area around the pipe; for satisfying final results, maneuver concrete under and around the brass. Once the concrete has filled the form up to the line you drew in the previous step, finish this particular stage of work by briskly and repeatedly hammering all sides of the form. 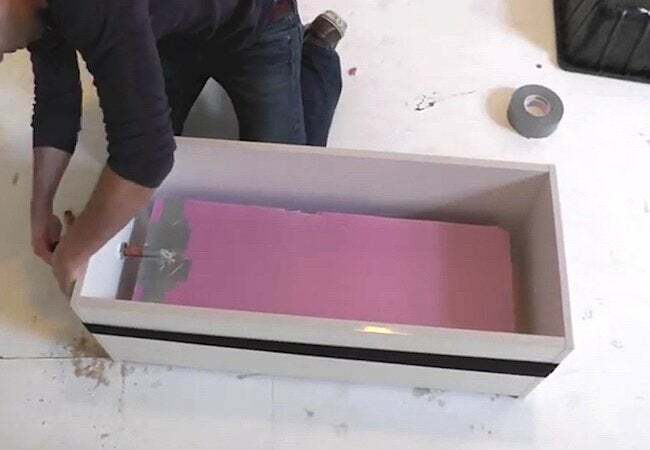 Doing so creates vibrations that force air bubbles to the surface, helping to ensure that the finished planter will be smoother and more stable. Place a piece of 3/4-inch-thick plywood, cut to the same dimensions as the rigid foam insulation, directly onto the face of the wet concrete. Push the wood down so that concrete rises up around its sides, leaving a flush surface across the two materials. If the wood keeps floating back up and out of position, weight it down with a heavy object. After that, it’s a waiting game. Let the concrete cure for at least four days. Once enough time has elapsed, begin deconstructing the form, gently breaking its pieces away from the set concrete. Consider using a circular saw for the purpose, but resort to power tools only if manual attempts fail. It’s important not to crack or otherwise damage the concrete, especially now that you’re so close to completion. With the sides of the form removed, go ahead and flip the planter over. Now it’s time to remove the insulation. Use a knife or a pry bar or a combination of the two, and expect the job to require some perseverance. Now that you’ve removed both the outer form and the inner insulation, you may be pleasantly surprised to see that, yes, you have something that very closely resembles a planter! The final steps are easy. First, install the casters by screwing them into the plywood backing. (Note that casters are available with metal, rubber, or plastic wheels. While metal may be the most durable, rubber and plastic are kinder to floors.) Second, screw on the spigot and seal around its flange with silicone caulk. This post has been brought to you by QUIKRETE®. Its facts and opinions are those of BobVila.com.